The interiors of businesses are changing. Employees look for comfortable workspaces that are inspiring and clients want to be welcomed with visual designs that connect with your brand. Corporate wall wraps and wall coverings are all the rage, but how are they being used? The basic principles of branding all began by finding the best ways to get your product in front of millions of consumers fast. 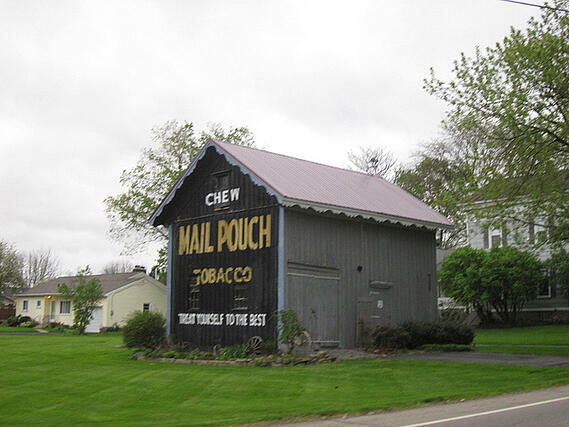 Think of those old Mail Pouch barns seen all around the Northeastern part of the U.S. These "barn wall graphics” may have very well been the beginning of using visuals to promote a brand. These barns were more noticeable than billboards and became quite the branding staple. They were visuals that invited and encouraged those to choose Mail Pouch over any other brand and sales roared. Our first example is the Gillette Corporation. Used in their corporate headquarters in Boston, the wall covering and graphics you see above scream their brand of the fresh, well-shaven man. Abstracts are used to convey the blades of a razor and look closer and you’ll see the Gillette name. Sitting in this lobby, one certainly knows the brand, the product and its brand image. Nike and its swoosh logo are famous, however, so are their core values of “A Better World.” Using wall murals in one of their overseas offices (seen above) one sees these values via text and imagery. The words Dream, Sport, Won’t Stop Making and A Better World all stand out. Boasting their values if you will, for all to see. The framed mission statement is out. Using wall coverings to display your mission in a bold way are in. 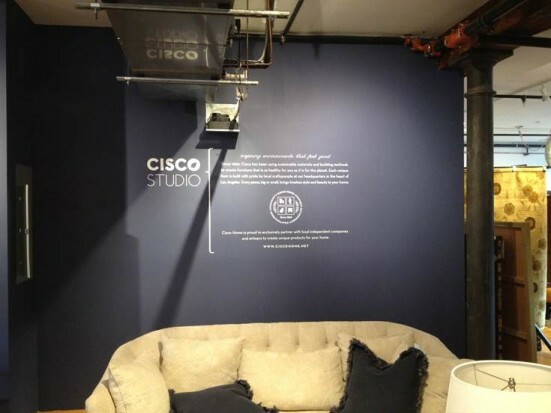 Take Cisco Studio for example. It is in their lobby they reveal what they are all about using a wall mural. Mission statements are perhaps all about the words, but the new rule is posting those words in a unique way combined with vinyl graphics. You see a lot of company timelines on corporate websites in their “History” or “About Us” sections. More and more, however, the trend is to place your timeline on an interior wall for all to see. 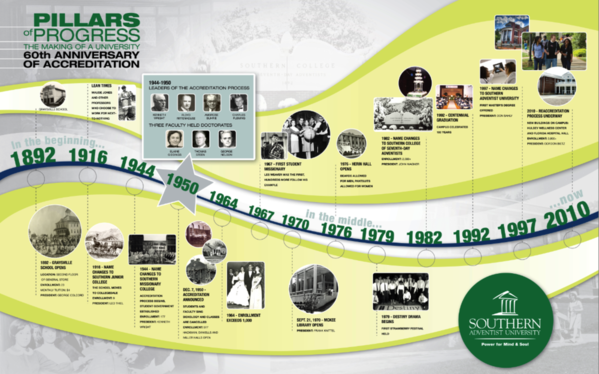 Take Southern Adventist University’s 60 years of accreditation timeline. Viewers are reminded of this university’s beginnings, its growth and success through text and imagery. 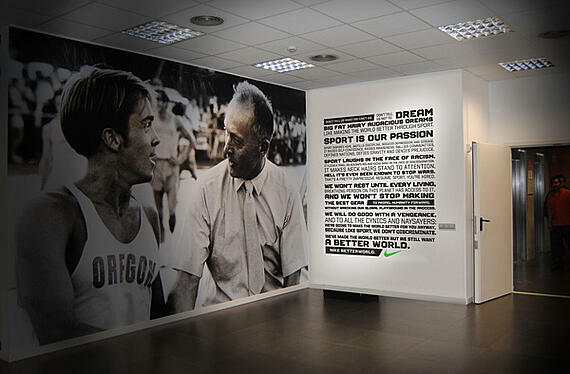 Inspire and motivate your workforce with wall murals and wall coverings that display your corporate culture message. 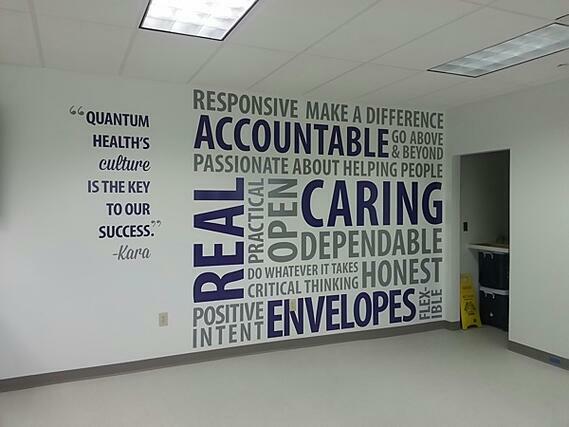 Quantum Health uses simple wall graphics that reveal their message in big and bold text. These become a daily commandment for all to see and also helps everyone to become brand ambassadors for a corporation. There are so many reasons to consider using vinyl wall graphics and digitally printed wallpaper to reveal anything or everything about your company. Be unique, be visible—be transparent. Announce your corporation for all the world to see.